This behavioral economics podcast is building on the most recent foundations episodes to really dig into the power of habit. Last week I really went deep into what habits are and how they work. Today, I am going to share a bunch of examples of ways businesses use habits to their advantage (and how you can too!) I talk about how advent calendars can actually build anticipation and release dopamine. I also discuss clever ways that Starbucks keeps customers coming back. I talk about how 95% of purchases are habitual and how this habit formation can be combined with reciprocity and loss aversion. I give several examples from big companies and my personal life. Then I break it all down so you can apply the same principles to your business. 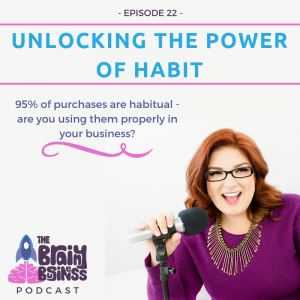 [11:36] Last week on episode 21, you learned all about what makes habits so powerful and the best way to form a new habit (either for yourself or in business). [12:11] Advent calendars are a staple of the holiday season. [12:59] Some big manufacturers have found a way to boost their sales before the holidays (and probably increase the likelihood that their bigger toys will be the focus of the big day). [14:10] A LEGO City Advent Calendar will generate interest in Legos all the way up until the holiday. [14:35] The excitement about what is going to be inside, and getting to see the next one…building anticipation… That is where the real enjoyment is for the brain. Once it has opened the box? Dopamine release stops. [15:15] You are also creating a habit of opening a gift every day! The brain wants to keep getting those small toys for the dopamine. [15:55] Is there something your business could do to incorporate advent calendars with your clients or customers? [16:52] The Starbucks app helps create the habit of coming back. They have also Incorporated loss aversion and integrated the power of habit into their app. [18:05] Be careful what lines you cross when it comes to knowing your customer, you may be inadvertently offending some people (like their set up that I can only get bonus stars by buying items I am allergic to). [18:57] They’ve also done the same thing with their treat receipts. Where you can get a discount in the afternoon. [19:26] Scarcity can become a habit if it is ingrained in who you are. Costco shoppers have the ingrained mindset that they better buy now because the item won’t be there the next time they visit. [20:33] 95% of purchases are habitual. [21:15] Daily active users are important for apps. You get bonuses each day in a row that you play. This is a combination of reciprocity, loss aversion, and habit – and it works very well. Our brains love it. [22:53] The most common “problems” solved by habits (the reward in the brain) are STRESS and BOREDOM. [24:48] KIT KAT was having a sales slump. They paired Kit Kats in the consumers’ mind as something that goes along with their break. Tying in with coffee and breaks made it so when people think “coffee” they think “Kit Kat”. [26:42] Availability was also used in this campaign. [27:29] McDonald’s hired a research team to increase milkshake sales. They discovered that people were hiring the milkshake to prevent their boredom on the way to work. [30:40] The research found out what was causing the habit and then made it really easy for more people to take up the habit. [31:06] You have to ask the right questions to get the right answers. [31:42] If you find people using your product in a way that you didn’t intend, that creates a new opportunity to market. [32:17] The cycle of habits. You want to use the cue/reward part of the habit cycle, not the craving/response part. [33:14] “If you lived here, you’d be home by now,” is a genius marketing and a good way to break the habit cycle and try to form a new reward option. [34:23] Payment habits. Every time you pay the mortgage and don’t look for another provider, you are habitually rebuying that loan. [35:07] Breaking the payment into very regular, small amounts, makes it easier to keep paying and doesn’t flag the brain negatively. [36:50] You get a renewal notice and your premiums have gone up a little bit. Suddenly that large yearly payment is something that prompts you to shop around for more affordable services. [37:41] Being on auto pay is easy and becomes a habit. [39:10] If you work on appointments, you should encourage a regular day and time for people to come in. People like to feel like they are important. [41:16] A pre-scheduled appointment can become an EXPERIENCE that you will pay more for. [42:38] When you can make it a habit and preschedule for people, it makes it less likely that they will break that cycle. [44:43] Many people including my friend Debbie Page say that the key to networking is showing up. [45:53] Engage with people on social media and selflessly share their content. This can make your name a cue for rewards. [46:51] Be consistent if you want to be part of people’s habits. The human brain likes repetition and reliability. [48:47] I knew I had to have a weekly podcast in order to make it a habit. [50:53] Consistency is a huge key to habit and now you know why – your brain expects it and is looking for those cues. [EXCITING ANNOUNCEMENT!] How to Launch an Amazing Podcast (using behavioral economics) online course is coming soon! Want to be on the list (possibly even a beta tester)? Email me – melina@thebrainybusiness.com with the subject line “Podcast Course” for more details.